Who Doesn’t Love a Good Throw Pillow? Right out of the gate I need to tell you that I have a problem. Problem may be too strong a word…maybe an obsession? I’m not usually a big collector of anything but I have to say that my throw pillow cover collection is growing, a little too quickly. I’ve been purging and organizing for the first time since we moved in last July and my throw pillow covers and inserts were in need of some major help. They were a mess and all over the place until I sorted them into bins. This is the “keep” section. I have a good defense for my growing collection (I think). 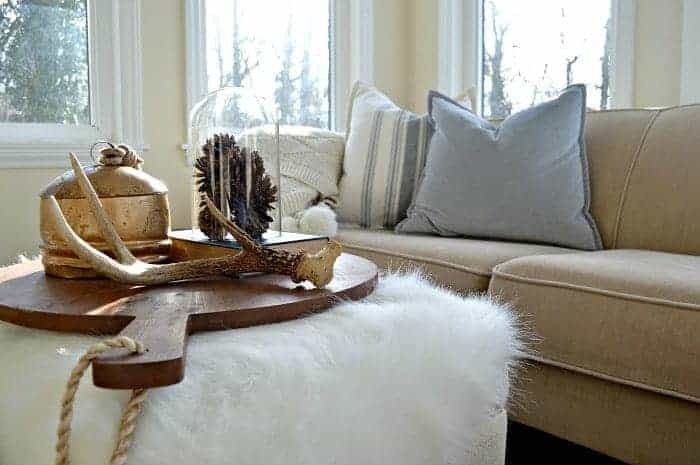 I love to decorate with neutrals (our sofa, chairs, window coverings and rugs are all neutral) and, in order to bring color or a certain style into our home, I’ve found that using pillow covers lets me do that without it costing a fortune. 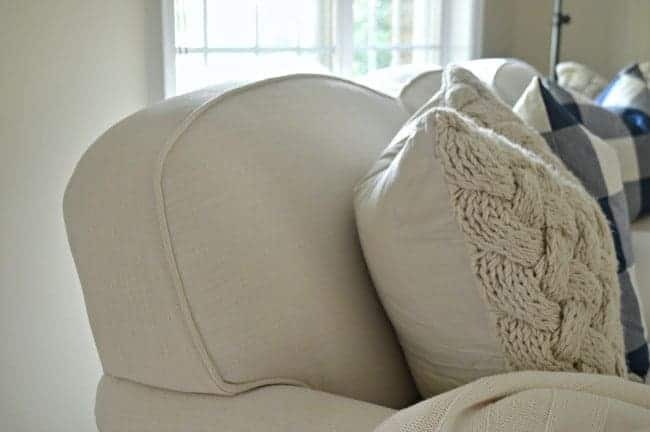 Buying pillow covers can get pricey don’t get me wrong, but it’s cheaper to change them out than it is to get new furniture whenever your style changes. For me, that’s often. Early on in our marriage I went through a jewel tone phase. Remember that one? I was so in love with my jewel toned striped sofa, forest green comfy chair and dusty rose arm chair…for about a year or two (and that’s being generous). It was the first set of good furniture we ever bought, and we weren’t exactly swimming in dough, so we had to live with my poor design decision. I kept that set for 10 years and, when we moved to a new house, bought my first neutral sofa. I had learned my lesson and decided that if I needed a change, it would be with decor or pillows. Things I could change out easily. So, what do I look for when I buy a throw pillow? It’s all about the covers…and the inserts. Let’s talk throw pillow inserts first. I’ve gotten a lot of pillows with different kinds of inserts since I bought that first neutral sofa, and have found what works for us and what doesn’t. 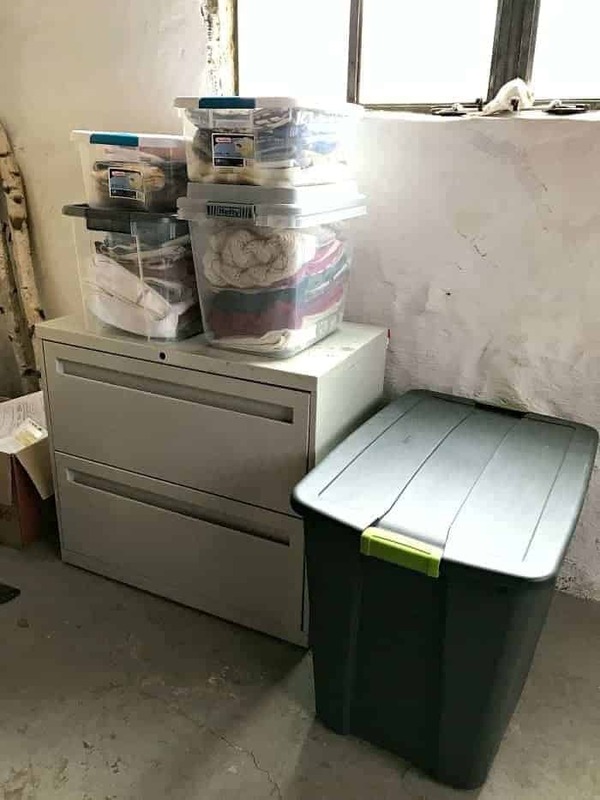 I have a lot of inserts, 4 large bins to be exact, from poly-filled to down, and I do use most of them, but each kind is used for a different purpose. My opinion on throw pillows is that, although the cover should look great, the insert is what gives your pillow that beautifully full designer look. I’m not a fan of the way a poly-filled pillow feels when I sit against it, so I use those inserts for decoration only. They are great for bed decor or on a chair that’s used occasionally. I also use them for the pillows on my front porch so they are good to have in your stash. Our sofas and chairs (the pieces that we sit on daily) have down-filled pillow inserts. I know that you can buy them almost anywhere now but I’m partial to a firm, down pillow, one that doesn’t squish down to the size of a pancake. It took me a while but I finally found the perfect inserts at an awesome online fabric store, Robey’s Fabrics. They have all different fills and sizes and they’re prices are reasonable. I have a back injury, and I’m pretty particular about what I sit on, so I have a few of the 25/75 down pillows for my everyday chair and they are so, so comfortable. They are pricey but the comfort is worth it for my back. Pillow covers are a personal choice so I can’t offer much advice on what to get. I have everything in my stash from IKEA, I’m loving their designs lately, to West Elm and Etsy. The good news is that there’s so many awesome sources out there right now and you don’t have to spend a fortune to get a pretty pillow cover. This pretty black and white pillow cover is from IKEA, $10! So tell me, what throw pillow tips do you have? I love throw pillows. Can you ever have enough? Thanks for sharing at the Inspiration Spotlight party. Pinned & Shared. Nope, you can never have enough throw pillows. That’s my official stance on it anyway. 😉 Thanks so much for stopping by Theresa. Love throw pillows too! Thanks for linking up at FNF! Thanks so much Courtney. Love linking up to FNF! Throw pillow covers are one of the greatest inventions since sliced bread and spanx! So happy to know that I’m not the only one who can’t get enough of them. I have so many throw cushions on my bed at the minute it takes a good minute to take them off before bed! I just can’t seem to stop. Ha, I know what you mean. I’m that way with our guest bedrooms. I don’t do a lot in our bedroom because my husband would lay on them and ruin them ;), but the guest bedrooms are where I have fun with pillows. 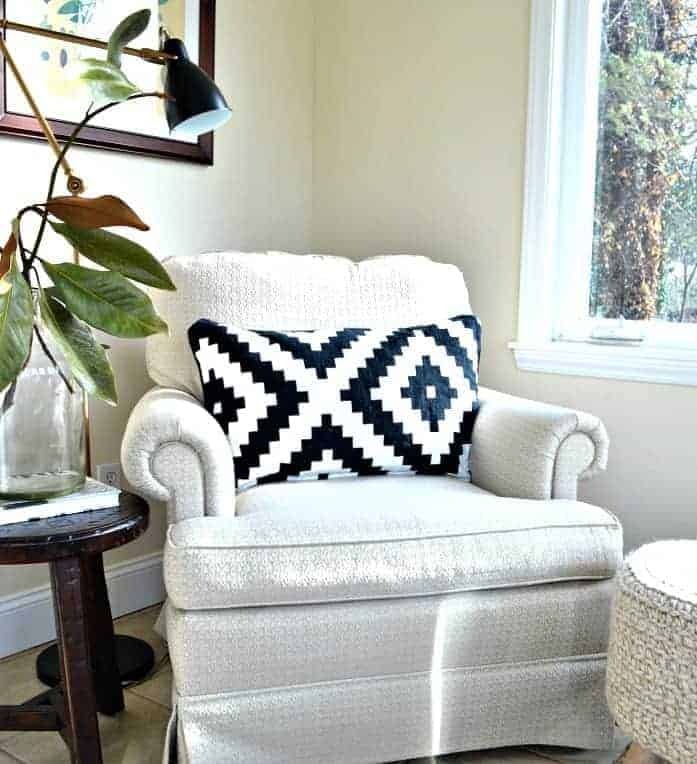 I love the idea of pillows because like you, it can get costly to redo furniture! I have a sofa that is the same color as your sofa. When we bought our sofa we bought a very well made sofa from a furniture store that has since gone of business. It has a steel frame and believe me it has lasted! We bought it in 1974 and I have reupholstered it in the same color just a different fabric. 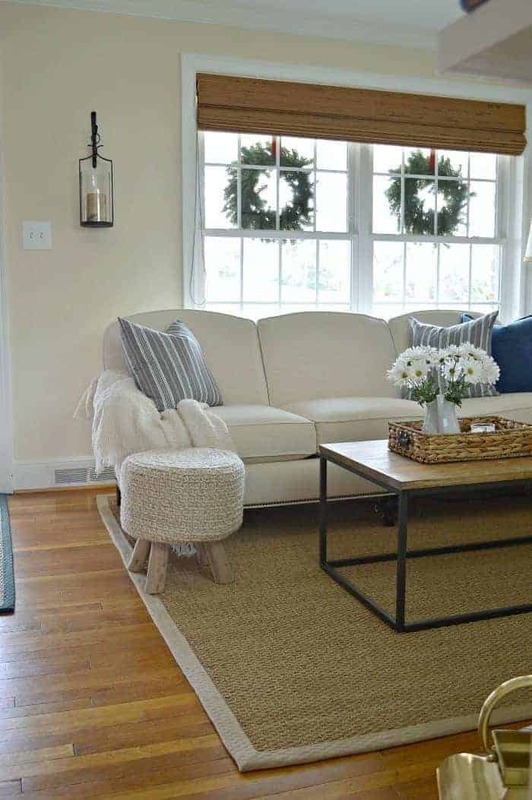 I looked at all kinds of patterns when I was ready to redo the sofa, but I always came back to the neutral. I’m very happy I did. My chairs are another story . . . we won’t go there though. I didn’t know there so many pillow inserts that you could choose from. I only have seen the poly-fill. I guess I have to get out more! I’m looking to change mine for this time of year. I put back my fall ones after Christmas. What do you do with the in-between time from New Year’s to spring? I don’t feel we should have spring colors, but I don’t want to be too heavy into winter either. I try to do a little something different during the winter season, after Christmas. Last year I did an icy blue (to brighten up the space) and this year I went with navy and gray stripes. Both last year and this year I got my covers from IKEA so they were very inexpensive. I never have a plan, just kind of wing it but, like you, I don’t want to put spring colors out just yet. Hope that helped. I love at the end of your blog, you list the items in the pictures & where you got them. So many times I see things that I really want & then go crazy trying to find them. Here you have them listed. What fun! Thank you for doing that!! I must share this post with my daughter, as I fear she thinks I’m in need of an intervention! I have pillow inserts and covers stashed wherever I can stuff them! I appreciate the information you shared. Oh my, I think there’s a lot of us out there that need an intervention. 😉 I’m so glad that you found the information useful. Thanks so much for stopping in. You are so right Kristi about going neutral on large pieces. I bought a custom sofa years ago in cabana stripe. I love it for summer but very limited for décor changes. The sofa though old is still in great condition because it hasn’t had a lot of use. It is also very comfy. A slip cover cost as much as the sofa did so I have summer décor year round. Good thing I live in Florida. Have a good week. I don’t think I have commented before, but have to say I really enjoyed the information and am going to check out the pillow inserts you mentioned. I live in a small apartment and tho I love pillows, it presents a challenge to store things. My income does not permit me to change the larger things, but love changing out pillows. Thank you! Hi Karen and welcome! I understand about having limited storage. We do have a little bit of storage in our basement but only 3 small closets in the whole house. I can’t buy a lot but pillows are my guilty pleasure. Thanks so much for stopping in and taking the time to say hi. Hmmm, I’m not sure I could name my style. 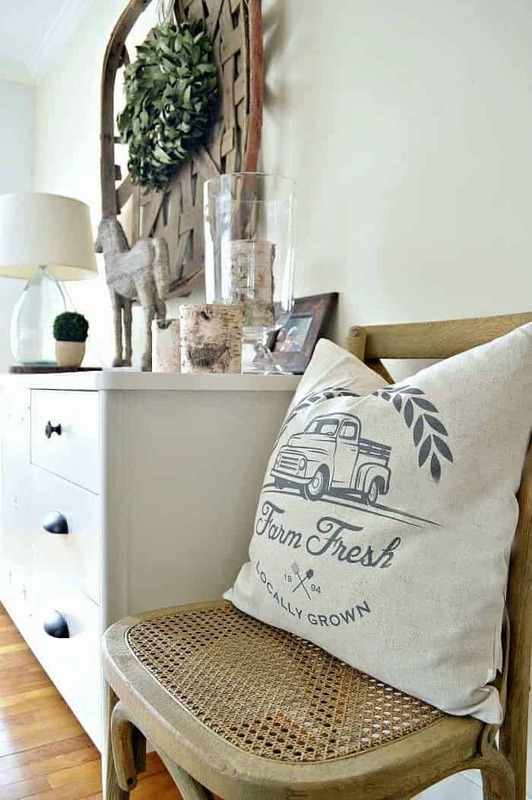 I’m kind of all over the place, a bit of farmhouse style, transitional. I guess it would be eclectic. I just really decorate with what I love, no matter the style. I do have a few pieces of furniture from Pottery Barn from 15 years ago but my tastes and style has changed and grown. I just try to incorporate them in with new (old) pieces. Morning Kristi,……and I thought I had pillow covers! As you say, they can change the look of a room entirely. I only like down inserts, as they keep the crease when you do the karate chop. 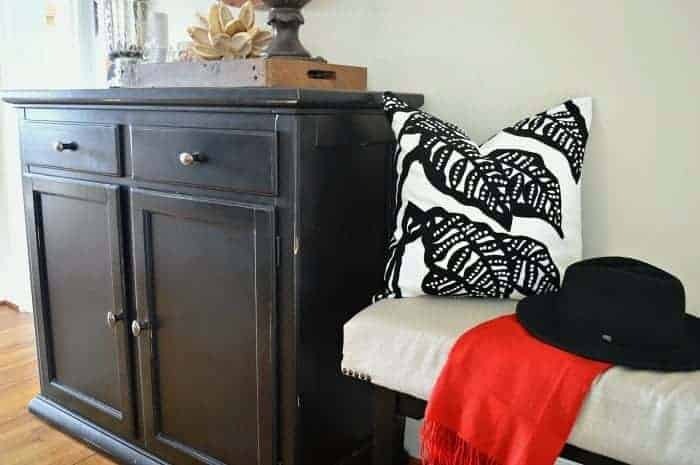 If I’m in a thrift shop and they have old grungy pillows I check the filling and if it’s down I buy them, throw the cover away and recycle the down insert, which can be washed, dried and reused.. Regards, Jacky. Hi Jacky. I think there should be a support group for all of us pillow hoarders. 😉 Thanks for stopping in and sharing that great tip. I’ll have to look around more in thrift stores.